This image shows the DR21 ridge, a very massive filamentary structure oriented north-south in the extremely active star-forming region Cygnus X. It resides at a distance of about 4500 light-years from Earth in the constellation of Cygnus, the Swan. A combination of three maps observed by ESA's Herschel space observatory, the image reveals the finely detailed structure of the cold interstellar material in red colour. This cold material is organised into filaments, many of which converge towards the main ridge. Within the ridge, bright white compact sources trace the very young new stars that are caught in formation, including several high-mass stars. Due to its large mass reservoir, the DR21 ridge is expected to transform into the most massive young star cluster in the whole Cygnus X region. Herschel also shows the evolution of star formation along the DR21 ridge from the southern, brightest object – the HII region DR21 itself – to the more northern, fainter, less evolved young stars. High-mass stars are rare in number relative to stars like our Sun, but due to their much stronger radiation and their death as supernovae, they have a large influence on the evolution of the interstellar medium in our Galaxy. These new Herschel observations strongly suggest that the convergence of filaments in areas like the DR21 ridge is a way nature forms massive star clusters containing high-mass stars. The filaments play an important role in the process as they channel material towards the DR21 ridge to build up a large reservoir of mass. The Vela Molecular Ridge is a vast star-forming complex in the plane of our Galaxy, the Milky Way. Observing this region at far-infrared wavelengths, ESA's Herschel Space Observatory has obtained an extraordinarily detailed image of the most massive component of this molecular complex, known as Vela-C. Located roughly 2300 light years away, Vela-C saw the onset of star formation less than a million years ago – relatively recently on astronomical timescales. Massive, as well as low- and intermediate-mass, stars are being born in this region, making it an ideal laboratory to study the birth of different populations of stars. This image reveals previously unseen detail in the cold mixture of gas and dust that pervades the region. 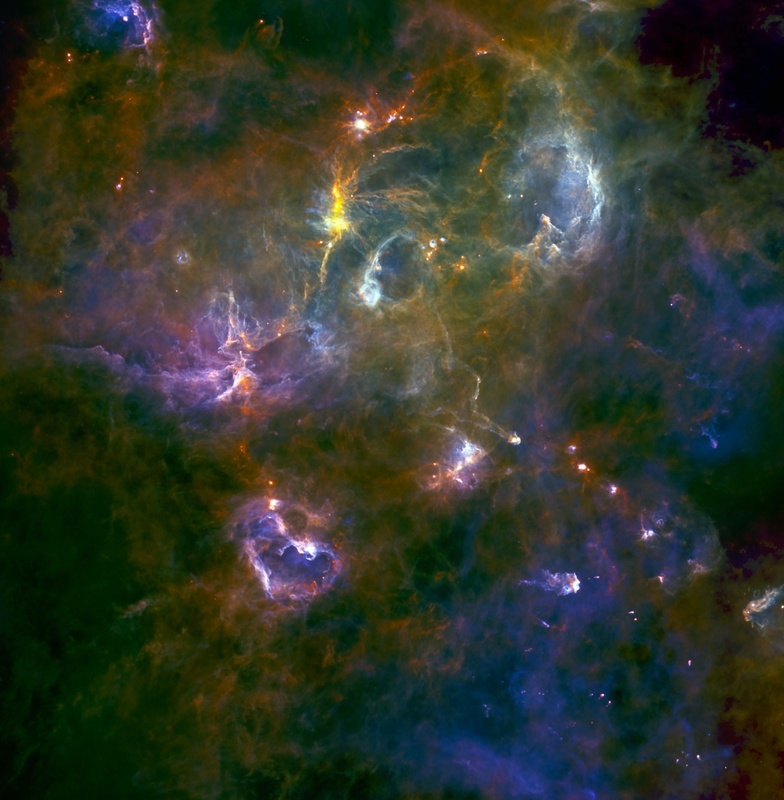 Cosmic dust is a minor but crucial component of the interstellar medium and, due to its low temperature, it shines brightly at the far-infrared wavelengths that Herschel is designed to observe. By detecting emission from cosmic dust, astronomers can unravel the distribution of the raw material out of which stars form. 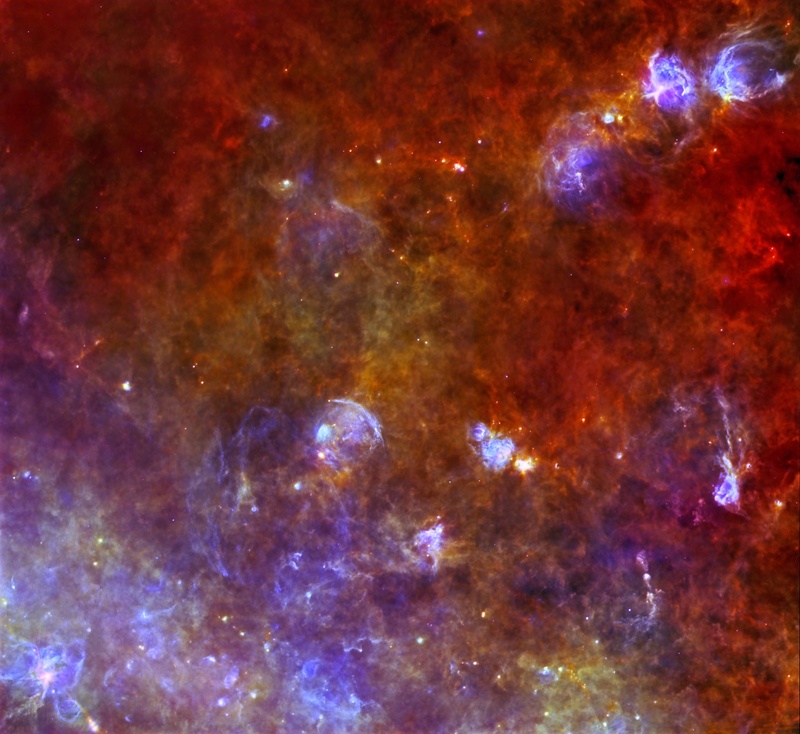 The coldest and densest portions of the cloud complex release most of their radiation at the longest wavelengths probed by Herschel, shown in red in this image. The cloud material is organised in a highly sub-structured network, with tangled and less organised material alternating with more defined and elongated filaments. Intricate bundles of material can be seen on the left, centre and right of the image. These nest-like structures are linked to one another by dense, ridge-like filaments. A number of white flecks dot the clouds and, in particular, the prominent ridge-like filaments in Vela-C. These flecks are in fact pre-stellar cores – compact clumps of matter that might eventually give rise to star formation – and proto-stellar cores, whose density is high enough for star formation to have already begun, eventually resulting in fully-fledged stars. As a result of Herschel's unparalleled resolution and sensitivity at these wavelengths, astronomers are able to carry out detailed studies of the properties, such as their mass and temperature, of the different cores across the nests and filaments. From the Herschel image, it appears that the majority of pre- and proto-stellar cores with large masses are found along the two densest filaments, suggesting that these sites are the most likely, in the cloud, to host the formation of massive stars. Studies done with Herschel data seem to indicate that the ridge-like filaments in star-forming regions such as Vela-C formed from converging flows of matter in the interstellar medium. The high densities in these thick, elongated structures induce massive clumps of matter to collapse under their own gravity, giving rise to high-mass stars. The nest-like structures, on the other hand, appear to be dominated by turbulence rather than by gravity and are likely to form mainly low- and intermediate-mass stars. Not only does Vela-C host seeds of future stellar generations, it also comprises a handful of objects that have already evolved into young, massive stars. 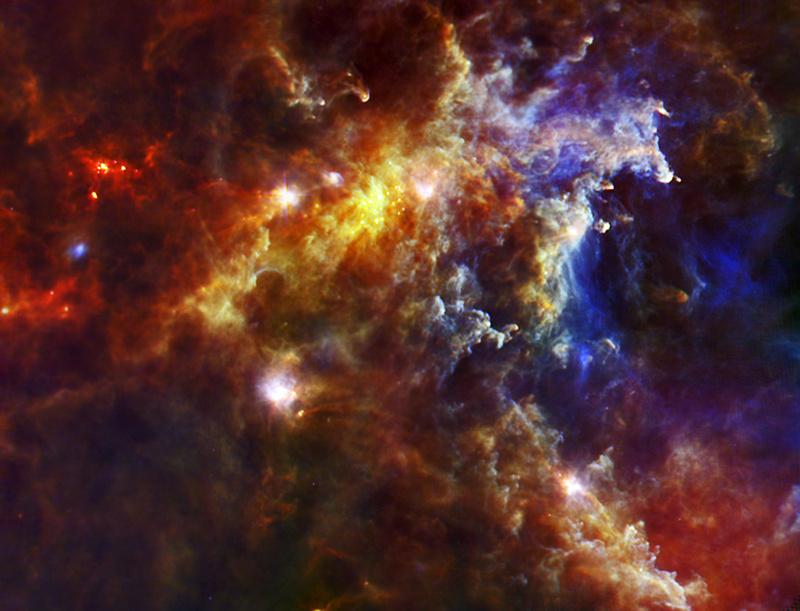 Embedded in the central part of the image is a stellar cluster whose stars are not visible in the Herschel image, but their effects are. 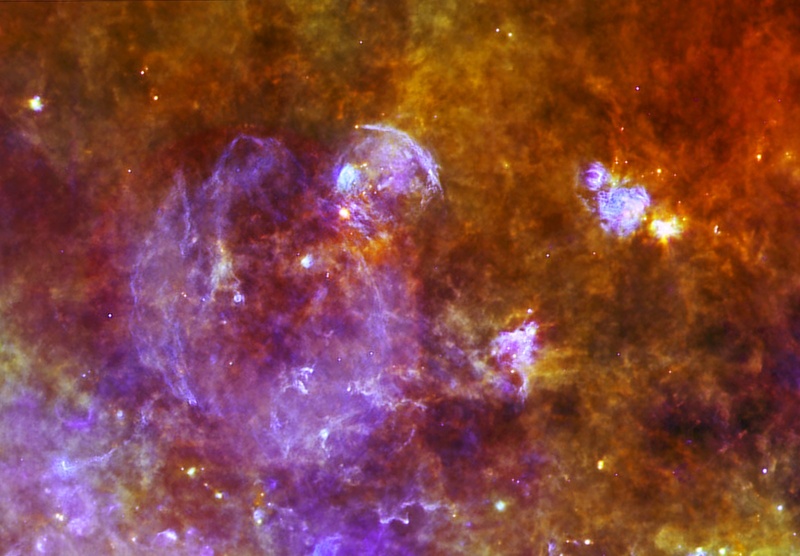 The butterfly-shaped structure at the centre of the image, known as RCW 36 (or Gum 20), is a result of winds and radiation released by the hot stars in this cluster. RCW 36 is an HII region – a pocket of gas that is being energised and ionised by the action of nearby young, massive stars. Due to its higher temperature relative to the colder material in the cloud, RCW 36 shines brightly at the shortest wavelengths probed by Herschel, indicated in blue in this image. 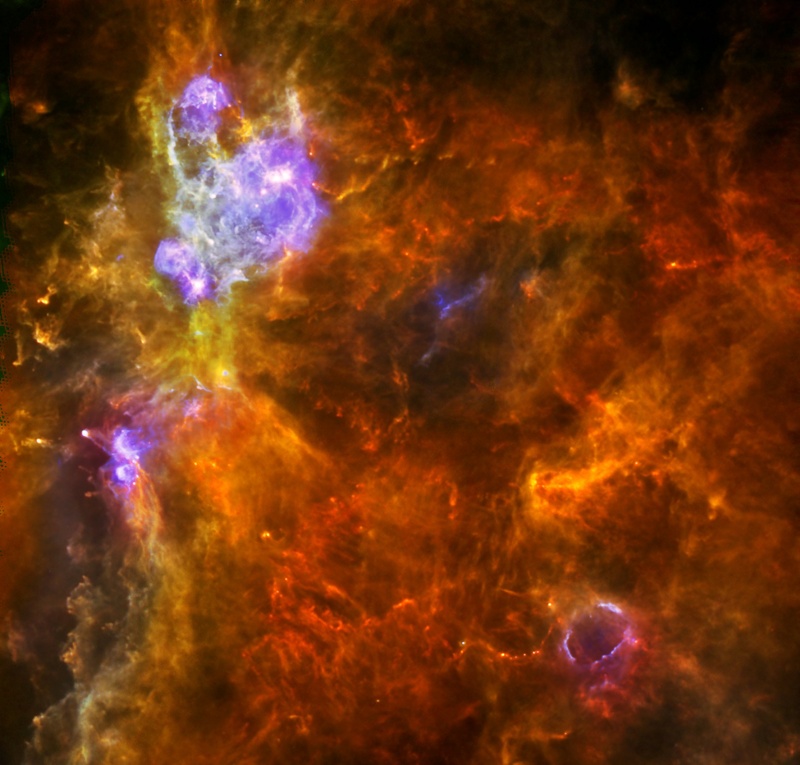 In the lower right corner of the image is another HII region called RCW 34 (or Gum 19); it is unclear whether RCW 34 and the hot stars that illuminate it are part of the Vela-C molecular cloud or whether they are located farther away. This image shows the broader region W48 around the supernova remnant W44 (SNR W44). 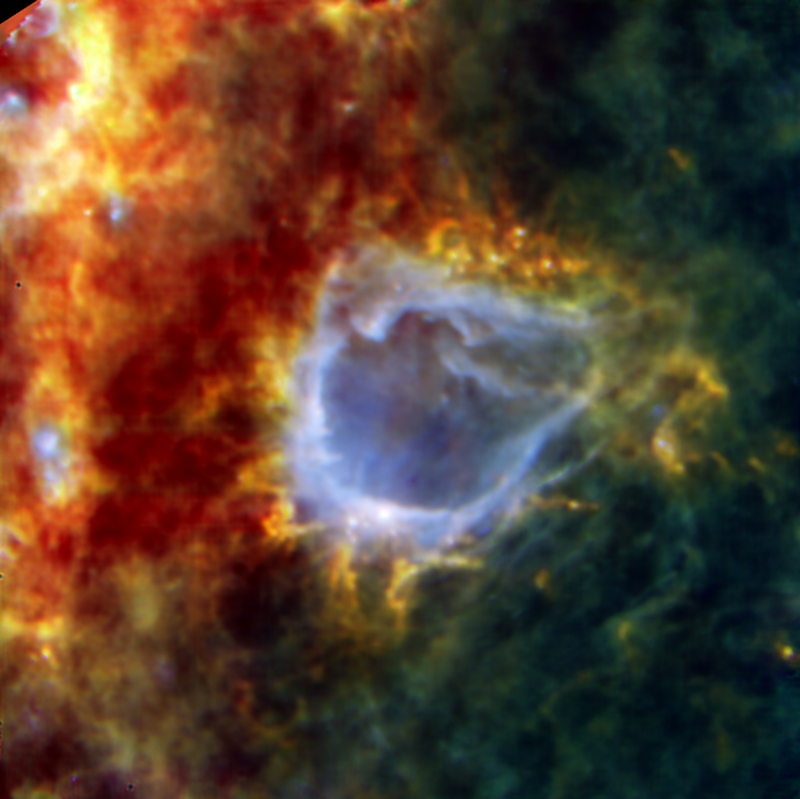 It is considered as a laboratory of massive stars from their infancy (within this red filament) to HII regions (blue bubbles) and SNR.